e-motion combines active mobility with therapeutic value. Thanks to e-motion, even wheelchair users who aren’t particularly strong are able to get around on their own. e-motion genuinely boosts wheelchair users’ independence; they can keep themselves active and mobile, while still training their vital functions. The strain on the muscles and joints is reduced and the effort is required to get yourself around and to extend your radius of mobility if minimalised. e-motion fits most of the wheelchairs currently available on the market. Almost all manual wheelchairs can be retrofitted with the e-motion by installing a simple mounting bracket. 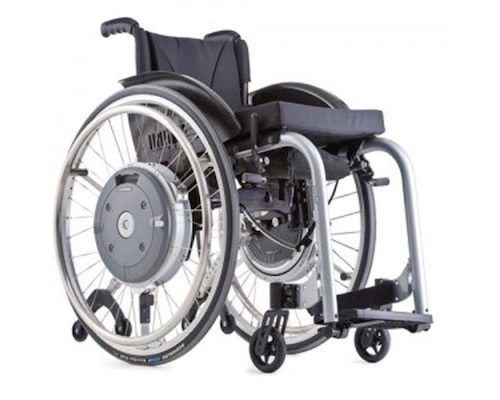 The standard wheels are simply replaced with the e-motion drive wheels, enabling the existing wheelchair – which has been set up and adjusted to meet the needs of the individual user – to continue to be used.